The lid works well as both a sturdy seat and an easy to use handle. Four 7 in. Lawn / Garden / Farm Supplies. 2 cubic feet. Lid makes for a sturdy seat. Easily moves plants, tool and more. Heating And Cooling Supplies. It is perfect for your gardening and tools transport. Don't hesitate, it will be your excellent choice to buy! Capacity (Cu. loading capacity. All poly construction. Rugged, 3-cu. Handle Material Poly. Flat-Free Tire(s) No. Tire Type Solid. ). Easyroller 3.0 CUFT Lawn Cart Assorted Colors: Tan & Black All Poly Construction With Extra Wide Wheel Base Provides Overall Stability Flat Interior Bottom To Hold Up To 200 LB Tool Clips On Side For Long Handled Tool Deep Tool Tray Keeps Tools Organized 10" Wheels With Tubular Steel Axle Makes Maneuvering Easy.Easyroller Holds Up To 200 LBs. 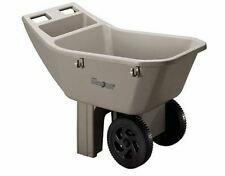 Deep Tool Tray Keeps Tools Organized 10" Wheels With Tubular Steel Axle Makes Maneuvering Easy. The lid works well as both a sturdy seat and an easy to use handle. Four 7 in. Lid makes for a sturdy seat. 2 cubic foot capacity. The lid works well as both a sturdy seat and an easy to use handle. Four 7 in. 2 cubic foot capacity. We stand behind our products.